Yes, in my home, we're a bit hockey-mad. Each year we await the new season and cheer on our beloved Toronto Maple Leafs. 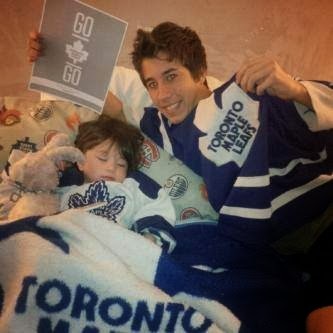 Several years before Eric, my severely autistic son, was able to say Mommy, he could say 'Go Leafs Go'. We make a habit of wearing home jerseys for home games, and away jerseys to watch away games. We pop popcorn and huddle together to scream, cry, cheer and jeer. But it is so much more. In an autism household it is very difficult to do things TOGETHER. The child/adult with autism needs so much care and attention simply to keep them safe that its hard to find time for your other kids. And when you do, it is often WITHOUT the child with autism. It is hard to find family activities that can be enjoyed by all, and altogether. So the evolution of my family's Hockey Night in Canada traditions are something that warm me to my very soul. When I was a child I was a huge Leaf fan. I watched every game with my dad. Any sport I played I chose 21 (Borje Salming) for my jersey number. When my children came along, we began new traditions. When the Leafs play The Habs (The Montreal Canadiens- major rivals) we order Chinese food and picnic in front of the game. For important games we pop popcorn (the old fashioned way) and HAVE to consume it before the end of second intermission. Failure to complete that mission inevitably leads to the Leafs losing. So we don't chance it anymore! Popcorn gets wolfed down. We must stand for the National Anthem, even Eric, my son who has to work so hard to be able to say a three word sentence, sings along. (I admit to having to hide my tears each time!). My youngest son Mark follows the stats in the daily paper and keeps us up to date. My son Chris is teaching his three year old daughter what 'off-side' means and she screams along with us. Just as I did with my dad, and my boys do with me. I habitually latch on to the youngest looking player, who becomes my 'babyface', maternal instincts on full tilt, screaming at the screen if anyone DARES check him. (Kaberle was the first, now its Reilly ) Mark's best friend Samuel, my 'fourth son' joins us for many a game, and is part of the traditions as well. Eric and I have a hand game- first high-fiving, then low-fiving, then alternate clapping to the chant ''High, Low, GO LEAFS GO!'' and my mother is NOT allowed to phone during games (she watches in her home) because she's a jinx! 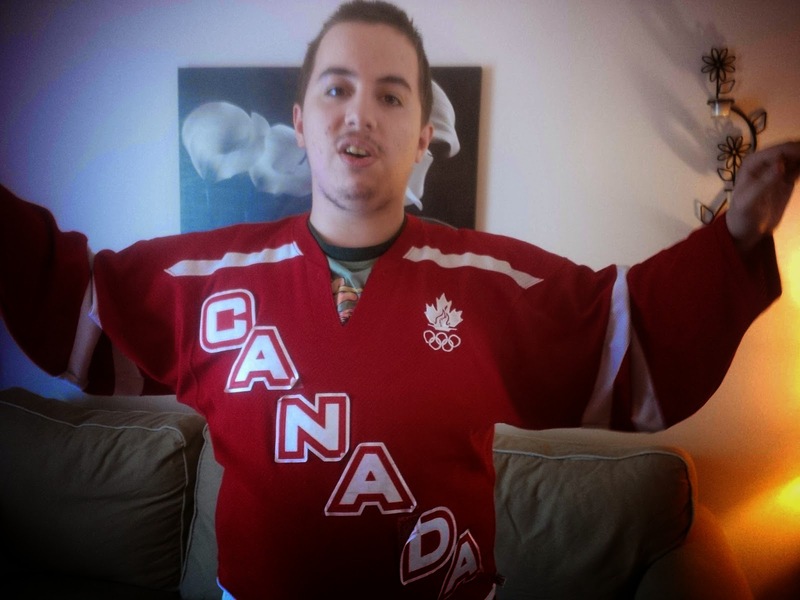 Eric cheering ''Go Leafs Go, Go Canada Go'' (he sometimes gets them confused lol! Its not the traditions and superstitions, even though we relish in them. And its not the joy we feel in the wins and commiseration in the losses. Through it all, the greatest thing, the thing we all value most, is that we are one. A family. Enjoying the same thing, at the same time, and enjoying that we are all enjoying it together. That is a rare gift in an Autism household. None of us take it for granted. ''The good old hockey game, its the best game you can name'' and the catalyst for my family's most beautiful memories of being a FAMILY.